In autumn collect as many chestnuts as you can. They should be dry and stored in a dry place. 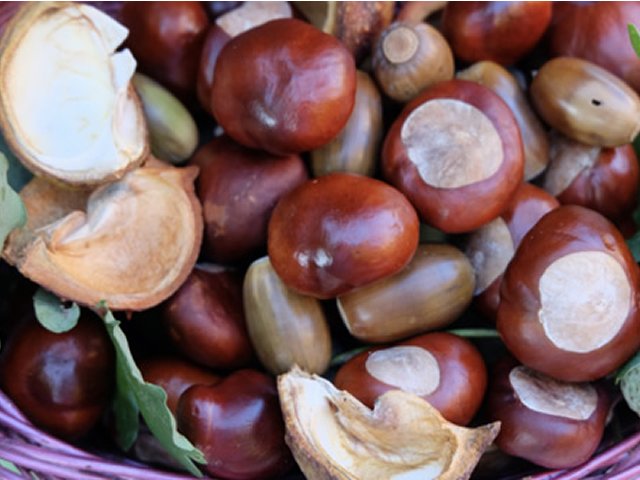 For the detergent, you need about 3 chestnuts per wash. They need to be cut into pieces; we always use a big bread knife for this. Place the pieces in a jar and fill with water and put the lid on. After one day soapy suds will have formed. This can be poured into the detergent chamber of the washing machine. The suds have no smell so if you so if you want pleasant smell, add a few drops of essential oil e.g. lime oil to the laundry. If you have hard water, you should use a descaling agent from time to time. We have been using the chestnut wash for more than a year and have not only clean clothes but saved money and done something good for the environment.